Founded in September 1994, the 1st Belfast Arsenal Supporters' Club originally met in the Balmoral Hotel. Subsequently in August 2004, the club was recognised by Arsenal Football Club as an official supporters club. Although the members are mainly from Belfast, we have members travelling from Antrim, Ballymena, Ballynahinch, Bangor, Carrick, Comber, Downpatrick, Dromore, Lisburn, Newtownabbey and Whitehead. In addition to this, there are a number of members who have left the country, gone abroad, yet remain members of our club. We pride ourselves on being a non-sectarian, family club and welcome supporters of all ages. The club still have some founder members, namely William Briggs, Paul Anderson, Michael McGreevy, Fiona Sawey and Peter Brady. We have members in attendance at all home matches and certain away games, in fact, over the past four years, we have travelled to places such as Paris, Barcelona, Milan, Porto and Glasgow for Champions League games. In the club's time, we have had members at all of the Domestic Cup Finals held in the Millennium Stadium and Wembley (both old and new), as well as the Champions' League Final in Paris. 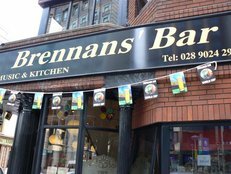 The club holds its meetings every other Monday night in Brennans' Bar (Opposite the Europa Hotel). Occasionally, when there is a midweek Arsenal match being televised, the meeting is held, after which members watch the game in the upstairs bar.